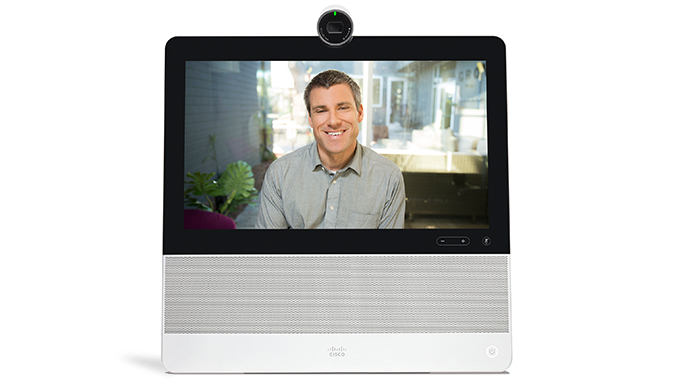 The Cisco DX70 offers every desk stunning HD video and audio. It’s easy to be productive on this affordable 14-inch touch screen device. And you no longer need an IP phone. You can easily set up the Cisco DX70 yourself in just a few minutes. And you’ll find all the commands right on the touch screen, which makes it easy to use, too. With its compact size, the DX70 is the perfect solution for homeworkers. And with Cisco Expressway it is easy to connect from anywhere. Setup: It's quick and easy (as long as your admin has registered your DX; see below). You can configure the device yourself; the setup assistant takes only a few minutes. View the Cisco DX80 and DX70 User Guide (PDF - 2.6 MB) to get started. Deployment: You can register the Cisco DX70 and DX80 devices to Cisco Unified Call Manager or Cisco TelePresence Video Communications Manager. Alternatively, you can register to the cloud with the Cisco Spark Service. Connect the DX and a nearby PC to your LAN using built-in Ethernet ports. If you want, designate separate VLANs for the PC and phone to improve reliability of voice and data traffic. See the DX Series Administration Guides. Not sure if the DX70 is the right model for you?